This image was taken on my third ascent up Stac Pollaidh in as many days. Only then were the weather conditions interesting enough to get the camera out. After a recent 15-day trip where I only got half a dozen images worth mentioning, I’m feeling slightly jaded. Not because I mind waiting days on end for the rain to stop (well I do a bit) but because I made the mistake of working out how much it had cost me to be there with so little to show for it, and then dwelling on how many things I could be doing if only I was back in the office. This kind of money-oriented thinking is death to my creativity. 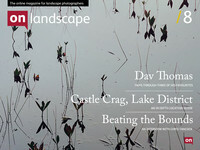 While I am certainly not motivated by cold hard cash - what landscape photographer is? - I do have to keep one foot in reality and pay the bills at the end of the month. This shot was one of four taken within minutes of each other that have all been published at various points. It is exceptional to get so many useable shots in one day. The costs of photography are going up, however the prices paid for my images are not – in many cases they are in decline. You might think the answer is to create more work to sell, however a threshold has been reached as there are a finite number of top quality photographs that I can make each year. This threshold is determined by the fact that I cannot spend any more hours making images than I already do, otherwise I would have no time to market them and do all the other things necessary to sustain my business. The only way I can produce more images is to make do with so-so light, which goes against every aesthetic principle I hold, resulting in substandard shots that in all probability have less chance of selling anyway. Either that or I need to learn how to bi-locate so I can double up my chances! While landscape photography has never been the best paid of jobs (and I understood this before I started) the situation is getting worse and it has most definitely been exacerbated by the proliferation of images available online. It seems that every other person with a digital SLR now wants to be a professional photographer, although some might be put off if they knew the difficulties involved. The issue is when people are willing to have their images published for next to nothing or for free, perhaps under the mistaken assumption that it will lead to paid work. Once you start giving work away people certainly won’t offer to pay for it. This is the paradox – potential publishers can see your work’s worth to them but not it’s financial value to you. There was a time when I somewhat naively thought that people would stop asking me if they could use my images for free, alas that day has not yet transpired. People continue to try it on because although I say ‘no’ the next person on the list may well say ‘yes’. After an unsuccessful morning shoot, I started the long slow climb to this spot. As sunset was around 9.30pm it was nearly midnight before I got back to my car, making the total working day around 20 hours long! Even after all these years I still find myself in grey area between two worlds: art and commerce. I think like a fine artist, as that is what my degree is in, however my personal experience tells me that the art world is not all that bothered by representational forms of landscape photography. Although I still yet hope to be proved wrong on this front. Consequently I sell the majority of my work to commercial clients, some of whom are willing to pay a reasonable fee, others who understandably want to pay the lowest price possible. I am not pleading a special case only on behalf of photographers, as equivalent problems plague many of the artists, writers and musicians that I know. My conclusion as to why the creative arts are so vulnerable is because, first, it is incredibly hard to get established until you have the requisite experience. For many the only way to gain this experience is to start at the bottom, which often means working for free in exchange for exposure or a foothold on the ladder. Second, unless you are yourself involved in that particular creative activity, it is unlikely that you can truly appreciate the time it takes to make it all possible. After four visits over the course of three years I finally got the combination I was looking for, the thrift in full bloom accompanied by dynamic lighting. Before I leave you with the impression that it is all doom and gloom, I still love my job and feel fortunate to have got as far as I have. It is a real privilege to spend so many hours in the great outdoors, observing nature and reminding myself what is really is important in life. For the foreseeable future I will continue to walk the tightrope, rewarded by the immeasurable joy that comes from creating photographs that celebrate our amazing planet. Fran Halsall has worked as a professional photographer and writer for nearly 7 years, taking as her inspiration the wild landscapes, diverse geology and different habitats of the British Isles. She is the author of two books, The Peak District (Frances Lincoln, 2008) and Light and Shadow (Frances Lincoln, 2010), and is currently working on a third. Fran is passionate about promoting the value of our natural heritage through her work and hopes that the national obsession with landscape photography is a sign that we moving towards a better appreciation of our environment. Even though this was taken only a short drive from home, it took many attempts to arrive when the heather was at its height and the light was suitably flattering. There are many locations that can only be shot in one particular season if you are to achieve the ideal lighting. With these south-facing cliffs winter is the best time.